In world travel, as in life, the best-made plans often fall by the wayside due to circumstances beyond our control. 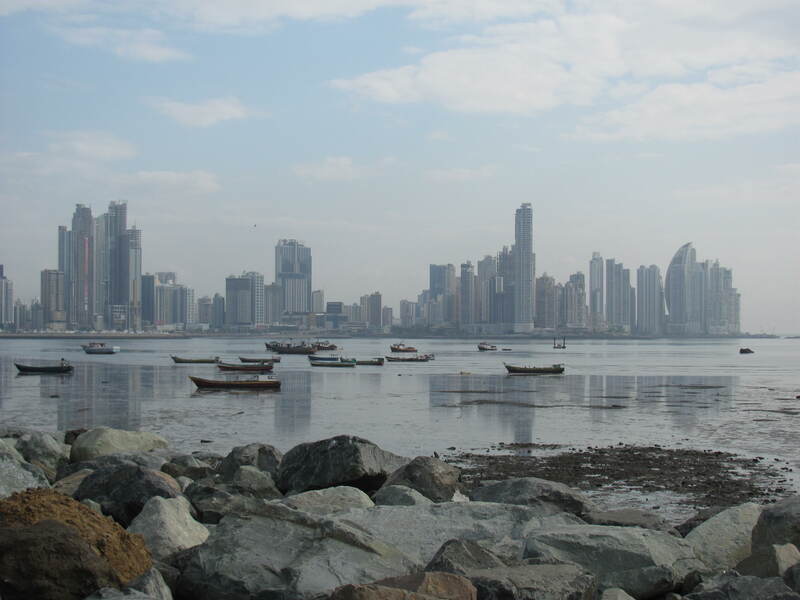 Before Brian and I got on the plane for a two-week trip around Panama, I had figured out an itinerary which would take in the best of the country by bus. 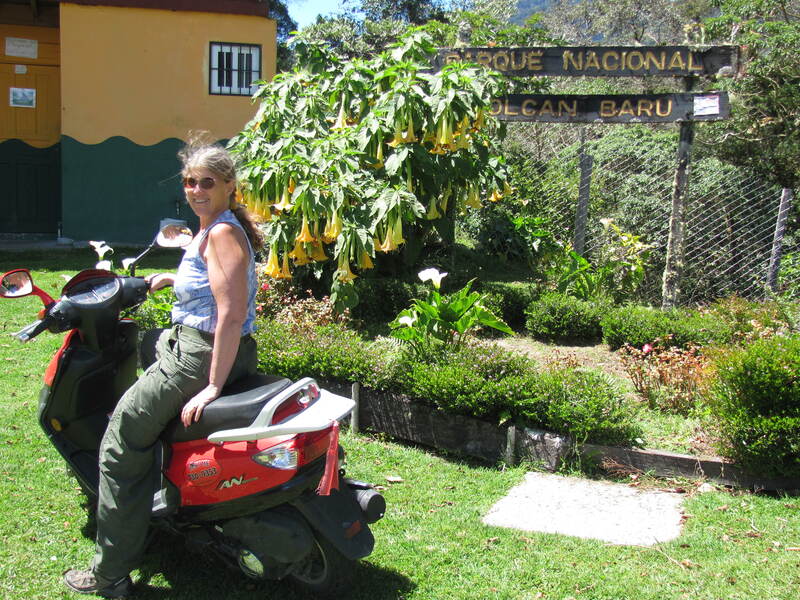 We were going to ride from Panama City up to Boquete, then proceed over the mountainous spine of the country to the Caribbean coast and the islands of Bocas del Toro. It was not until we actually landed in Panama City that we learned about an uprising in the indigenous population, which had disrupted travel on the Pan-American Highway. In the time-honored tradition of banana republics everywhere, the local Indians were protesting a land-grab of their ancestral lands by big mining interests. The rebels, lacking the firepower of the government-backed corporations, rolled huge boulders onto the main artery through the country. Then they stood on the road, throwing rocks at passing trucks, until they had effectively shut down the highway. It was a classic David-versus-Goliath drama, and we could not help but root for the underdogs. Even though it meant that my carefully planned itinerary went out the window. On the small-screen television in our hostel in Panama City, we watched live coverage of the insurrection. Other travelers said the Pan-American Highway was closed indefinitely, and they had various theories about how to get around it. My first plan was to wait a couple days and see if the situation resolved. 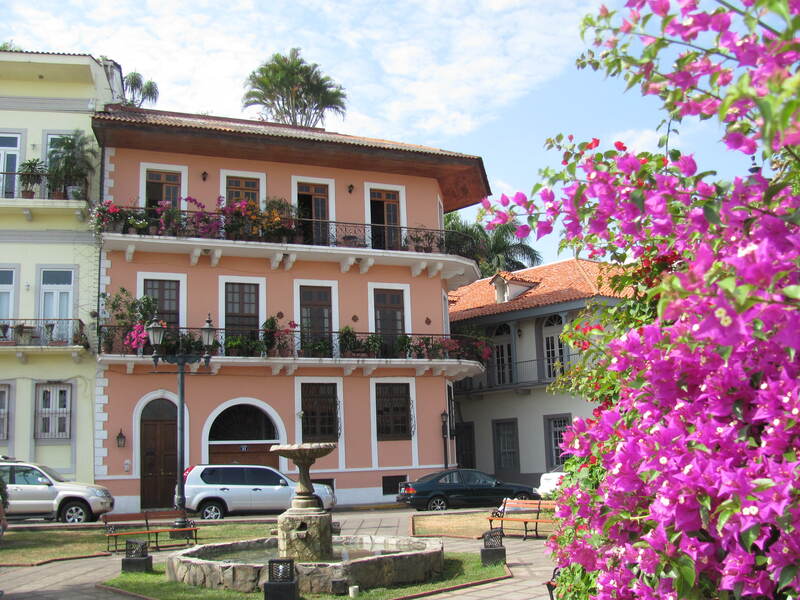 So we spent one day walking around the “old town” and the sea-front malecon, and another day riding a local bus to Miraflores Locks to view the Panama Canal. After two days, there still was no change in the highway situation, so I called and purchased two seats on a small airplane headed to Bocas del Toro. If we couldn’t do the trip in the planned order, we would just start at the end and go backwards. The flight from Panama City to Isla Colón took less than an hour, but the two places seemed worlds apart. 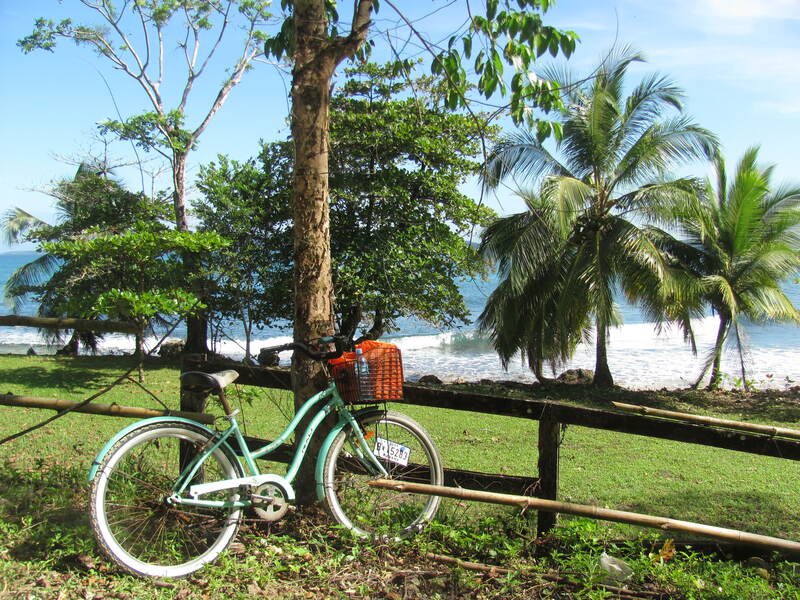 The Bocas del Toro islands have a mellow, relaxed Caribbean vibe. 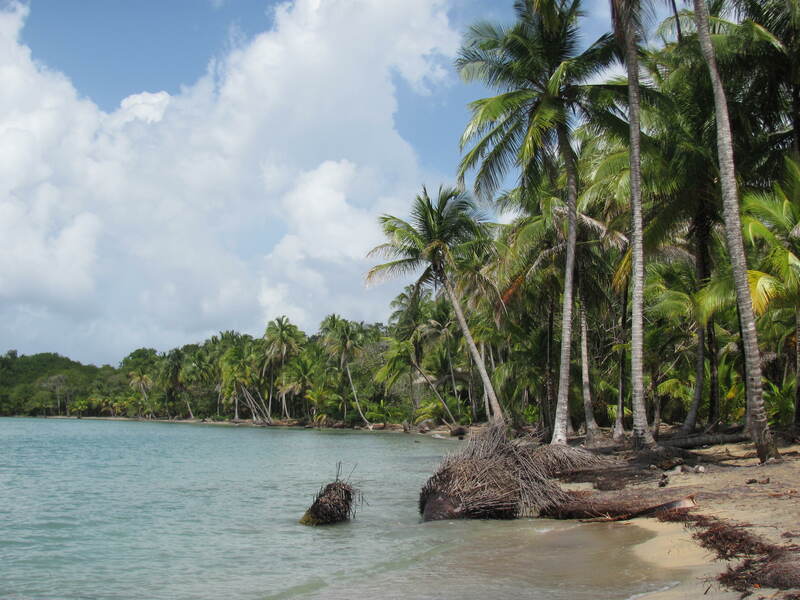 Thus far largely undiscovered by the hip ex-pat community, the islands are connected to the mainland by ferry and to each other by water taxis for hire at the main dock in downtown Bocas. We entertained ourselves for several days snorkeling in the islands near Isla Colón, wading and bodysurfing at Red Frog Beach, bicycling to nearby golden sand beaches, and eating seafood and treats from the local panaderia. From there we crossed to the mainland and boarded a chicken bus for the six-hour-long ride over the mountains to the Pacific side of Panama. Grandmas and babies and dogs and young working men sat three to a seat or stood in the aisle during the slow route that stopped in every little town. The bus dropped us at the main plaza in the town of Boquete. Not having any advance reservations, we made our way to a nearby local hostel, where we spent a miserable night on lumpy beds listening to obnoxious bar music blaring in through a window that didn’t close. The next day I hiked around until I located a much quieter room up the street. There we stayed comfortably ensconced for a few days. I went on a day trip with a group of hostel kids to a hot spring, while Brian enjoyed sitting in the central plaza watching people and making friends. 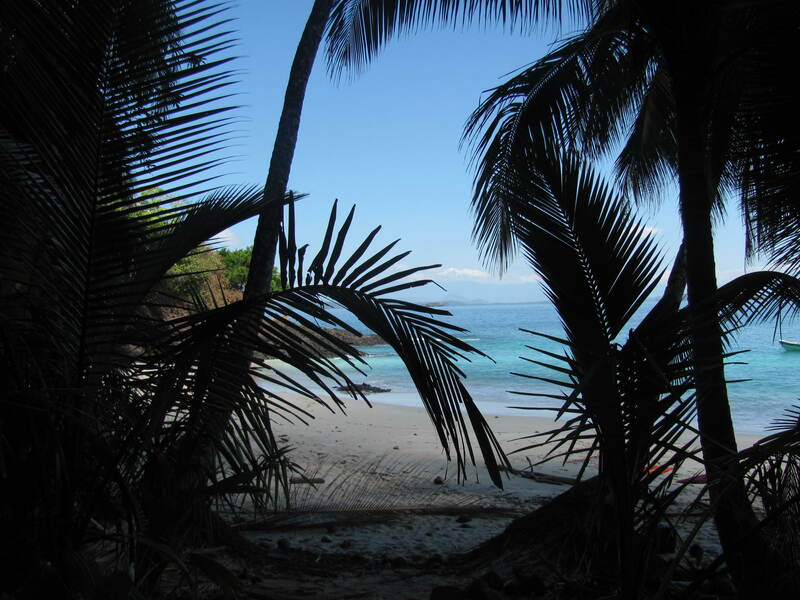 Boquete had a hefty population of ex-pats who regularly traveled back and forth between there and Quepos, in southern Costa Rica. We enjoyed meeting some of them and listening to their discussions about the pros and cons of living full time in Panama. One day we rented scooters to explore some of the countryside around Volcán Barú, Panama’s only volcano, now dormant, and rising to over 10,000 feet elevation. For Brian, that day was the highlight of the whole trip. Reading ahead in the Lonely Planet book, I got a jones to visit the national park at Golfo del Chiriquí on the Pacific Ocean. The guide book advised that reservations were necessary weeks in advance to secure a spot at the only lodge within the park. Hoping for a miracle, I e-mailed the lodge and almost immediately heard back that they had just received a cancellation. So they offered us one “rustic room” at Boca Brava, bathroom down the hall, for $10 per person, take it or leave it! Of course, I took it. Departing from Boquete the next day, we rode on two different busses, a taxi, and a water taxi to make our way to the island lodge. Once there, Brian relaxed in a hammock and talked to other travelers, while I went on a day-long snorkeling trip to a couple of the islands inside the national park. Our rustic room turned out to consist of two mattresses on the floor and a sea breeze blowing through open windows. Not too bad of accommodations for ten bucks. By the time we were ready to leave Golfo del Chiriquí, almost a month had passed since the start of the Indian uprising. Asking around, we learned that the opposing sides had recently come to an uneasy truce, and the boulders had been removed from the Pan American Highway. So we walked out to the highway and almost immediately flagged down a plush double decker long distance bus that was on its air-conditioned way to Panama City. Six hours and $30 later, we found ourselves back in civilization, with one more day to spare before our flight home. It happened to be Mardi Gras, so we dumped our backpacks at a cheap hotel in the Casca Viejo section if the city, then spent the evening enjoying the festivities. Returning to the hotel late in the evening, we heard multiple fire truck sirens. We climbed up to the roof to see what was going on. A whole block of the city was ablaze! Though I felt sorry for people whose apartments were burning, I must say it was a spectacular show to watch from afar. The impromptu entertainment of a raging structural fire was a great way to end our seat-of-the-pants backwards trip through Panama.